Can you help identify this mystery chief? Someone brought a vintage photographic plate into my parent’s print shop this week, and we’re looking for any clues regarding the subject of the portrait it contains. What tribe is he from? Do the garments indicate any specific dates or regions where this Native American may have lived? The image to the right is a scan and inversion of the plate, showing what a print made from the plate would look like. Judging from the material of the plate, I’m guessing it’s a Tintype (also known as a Ferrotype) plate. Tintype caught on as a photographic method in the US around the mid 1800’s. Although still in use as a novelty as late as the 1950’s, Tintype was eclipsed by better technology by about 1910. If this is in fact a Tintype plate, the date of this image would most likely fall between 1854 and 1910. That’s almost 60 years of history spanning the Civil War until the years before WWI — a very wide span. We’re going to have to rely on the subject of the portrait to narrow the scope. I am not very knowledgeable about vintage Native American attire, but I think the eagle feather headdress our mysterious subject wears is a warrior bonnet and indicates he is a chief. It could also be a clue about his tribe. 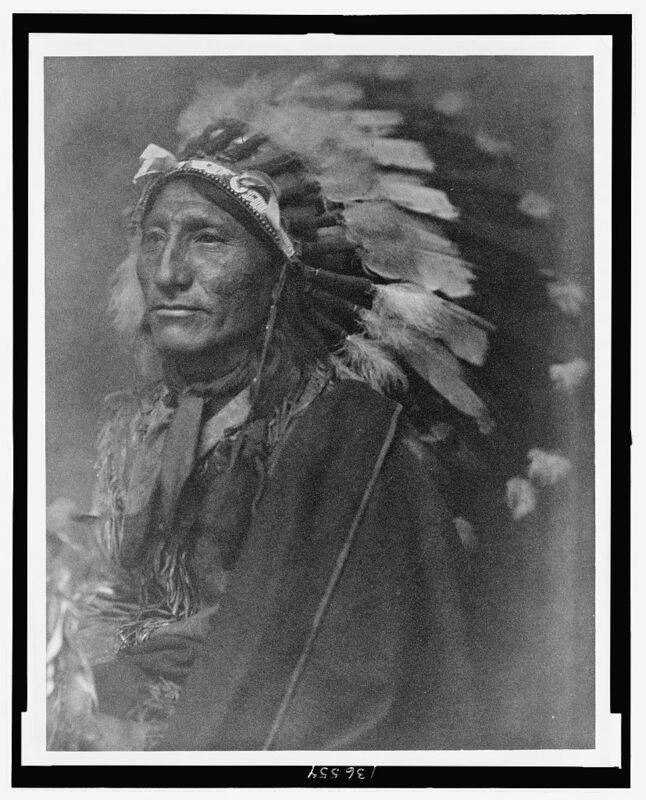 Elaborate ceremonial head wear was common to most native tribes, but the particular style of mystery chief’s bonnet seems to resemble that of the Plains Indians. To me, it looks very similar to the headdress worn by the Sioux chief American Horse in this photo from c. 1900. 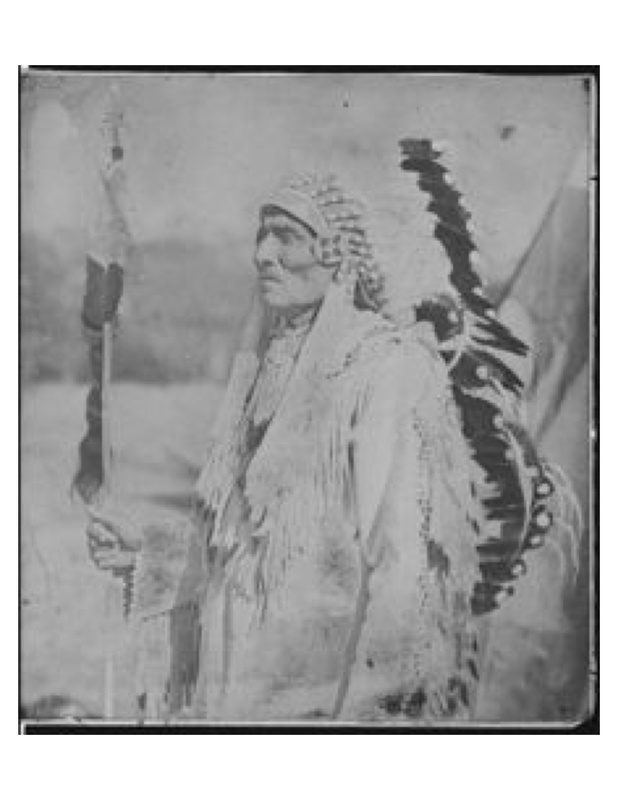 The Cheyenne also wore very similar garments, as seen in the photo below, also from around the turn of the 20th century. In the mystery photo, it seems that a portion of a teepee can be seen over the shoulder of the chief. If so, that would further confirm a connection to a Plains Indian tribe. I got to handle the plate for the photo! It was a piece of art in itself. The owner wants to believe he is a medicine man because she can’t see an arrowhead on the shaft. When I scanned the plate and inverted the image in photoshop then adjusted the levels, I’m seeing a pretty good sized arrowhead…do you? There is a tee pee a bit blurred in the background behind his headdress and I believe human hair on his shaft [of the lance in his hand]…The scalloped edge of his sleeve and the 4 point beaded star at his temple are all clues. Beadwork was common to all Plains Tribes, but the geometric star pattern at his temple appears to be one of the best unique identifying marks in the image. From my research so far, both the Sioux and Sans Arcs were known to incorporate star patterns into their geometric bead designs. We’ve combed the Library of Congress online image archive and scanned the Smithsonian’s National Anthropological Archives with no matches. Both collections are extensive, so we’re hoping some of our history-loving friends can narrow things down. Any ideas or insights are appreciated! We’ll keep you posted. This entry was posted in history, photography. Tagged "mystery chief", indian. Previous Post Previous post: Ever wikipedia’d your alma (doesn’t) mater?